What a night the October 27 meeting of the Workshop proved to be. Great food (thanks everyone), scary Halloween-inspired reads (that filled two rooms!) and a celebration of the 300 traditionally published books written by DFWWW members. Historian Stephen Manning summarized this momentous achievement by providing some interesting trivia. Of the 300-plus novels displayed in the Trophy Room, what is the most commonly used word in a book's title? Texas (no one was surprised). The third most commonly used word in a title? Gun (notice a trend?). 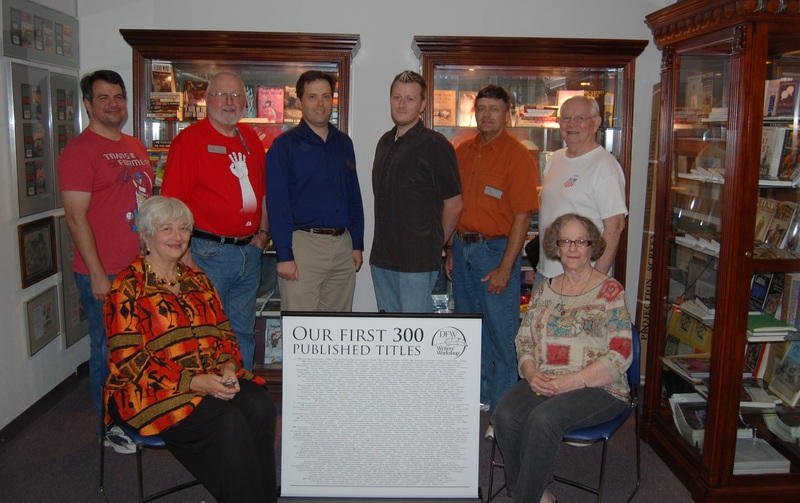 There have been an average of 11.6 titles published per year by DFWWW members since 1985. The best year was 1996 when 22 titles were published (all comprised of only two genres: Westerns and horror). The second best year was 2005 when 20 titles were published (notable because of the large number of first-time novelists). From 1985 until 2000, the Workshop produced mainly Westerns, mysteries and horror novels. After 2000, there was an explosion of all genres, with nonfiction works becoming more prominent. In the news, Kenneth Ingle displayed the audio version of his novel, Saragosa Prime, released by Books in Motion. Carolyn Williamson announced the additional of two new reference books for the Workshop's library. In official news, President Russell Connor reminded members that next Wednesday nominations open for the 2011 Board of Directors. Secretary Kyle White, who will serve as the election coordinator, advised members on the requirements to run for the Board. Basically, members must have paid their 2010-2011 dues and have attended at least three of the five monthly business meetings prior to the election.